Hi Friends: Here's a recent layout of a snapshot I took while we were in Tuscany a few years ago. We were on a wine tasting tour and this was our first stop - a beautiful little vineyard. We had so much fun tasting the wines and enjoying a little snack. You can see a hint of the vines in the background of the photo. Enjoy the details, below. And it's snowing right now, so think of warmer weather like what's in the photo! Have a great day! Prep background paper with clear gesso. Once dry, use stencil and embossing paste to add texture to background, then color with LSG sprays. Cut paper flowers and shapes from Mariposa paper and arrange on background, then sew around the edges of the paper with sewing machine. Tuck lace behind sections of the paper flowers. Prep chipboard with gesso, then heat emboss / color with Versamark and embossing powder. Add rub-on letters to the photo. Frame photo with matching patterned papers, ink edges, then layer with cardboard over a piece of cheesecloth. Frame with leafy vine chipboard. 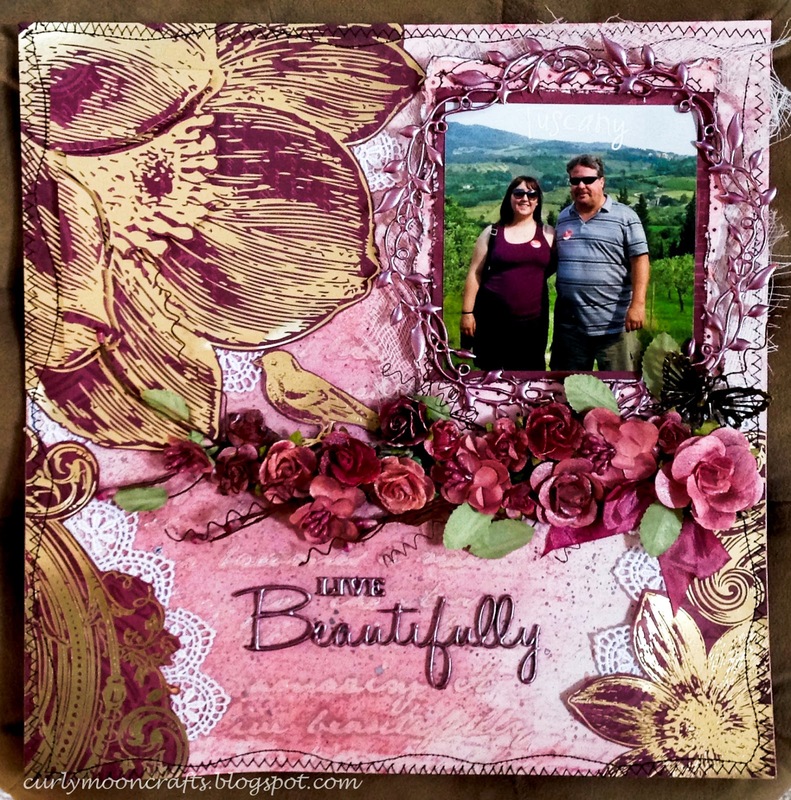 Add floral vine under photo and fill-in additional flowers colored with the same LSG sprays. Color ribbon with Distress Stain and insert under flowers. Add some wire swirls to the vine. Cut bird from the Mariposa paper and add to left side of vine. Add metal butterfly to right side of vine. Finish with chipboard title and splatters using the LSG sprays. 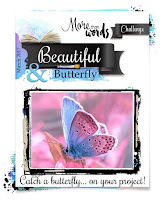 Wonderful page, lovely details and use of color!Thank you for joining More Than Words challenge this month. Such a beautiful interpretation of our challenge. Love what you have done here. Thanks for playing with us at More Than Words challenge. Beautiful layout!!! Love the colors! Thanks for joining us at More Than Words! Oh wow - wish I was there! What a fabulous interpretation of the challenge! So glad you could join us at More Than Words. This is a gorgeous picture and a lovely layout! Thank you for joining at More than words! Lovely!!! Thank you for playing with us at morethanwords challenge. Oh this is so pretty! Love the colors and the title! Thank you for playing along with us at More Than Words!